Cracked masonry must be immediately repaired and there is no better way to achieve truly professional results than with the Twistfix Crack Stitching Kit. Designed to offer a comprehensive solution to cracks in block, stone and brick walls, the kit delivers exceptional value for money, making it a constant bestseller here at Twistfix. The Twistfix Crack Stitching Kit centres on our helical crack stitching bars, which are manufactured using grade 304 stainless steel, a metal renowned for its strength, versatility and resistance to corrosion. Each high-tensile, precision-profiled bar is bonded into pre-cut horizontal slots in bed joints, stitching cracks and restoring structural integrity. Though any building can suffer from cracked masonry, the problem is most often noticed in older properties. Crack stitching bars are the ideal solution as the retrofit brick reinforcement system creates a minimum of disruption during installation; as the bars and grout are both totally concealed afterwards, the original aesthetic and character of older buildings is easily preserved. The contents of the Twistfix Crack Stitching Kit have been selected by remedial masonry experts. 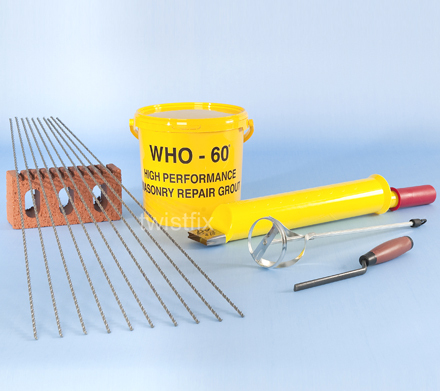 Along with the crack stitching bars themselves, the kit contains specialist WHO-60 masonry repair grout, which is used in conjunction with a Grout-Master applicator and Hi-Flo nozzle; these components are also supplied with the kit. A helix mixer paddle and brick jointer completes the contents, making this one of our most cost-effective products. Find out more about the crack stitching solutions and other brick repair products available from Twistfix on our website.